Product prices and availability are accurate as of 2019-04-22 02:04:21 UTC and are subject to change. Any price and availability information displayed on http://www.amazon.com/ at the time of purchase will apply to the purchase of this product. This is the same high-quality bra as the Simple Wishes Signature Bra, the only difference is this option doesn't include the 1" Center Panel. 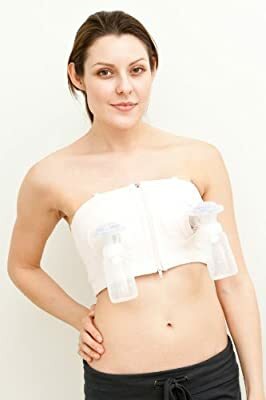 The Center Panels are used by women who need to create a little extra space between their breasts to get proper alignment of the breast pump bottles with their breasts. If that's not you, then you've found the right choice! The D*LITE Bra allows you to handle other tasks while pumping, helping keep you on top of your to-do list, or allowing you to get that few extra minutes of sleep. Remove the hassle and time constraint of pumping, with this hands-free pumping bra. The D*LITE Hands Free Breastpump Bra offers exceptional hands-free support of breastpump bottles and adjustability in size as a nursing mother's shape changes. Adjusting the size of the bra is a breeze by tightening or loosening the secure Velcro back panel. Included with this bra are straps to allow for Racerback, Standard, or a Strapless fit, ensuring you get exactly what you need! Freedom - Hands-free breast pump bra with impeccable design, maximum comfort, and the freedom for you to work on tasks or simply relax while pumping Adjustable - Comes with a convenient 10" adjustable Velcro back panel to ensure a perfect fit as your body goes through natural changes during nursing Options - Designed to work with all major breastpump manufacturers, including Medela, Philips AVENT, Lansinoh, Bellema, Evenflo, and Spectra Baby Effective - Enjoy no fuss and no mess with a reliable, tight seal of breastshields and flanges from our four-way layering support system Washable - You can safely machine wash this bra in cold water, on a gentle cycle, with non-chlorine bleach if needed. How convenient!